From the infant’s ability to read two dots and a dash as primitive features barely before its eyes can focus, to the instinctive imagining of the unseen correspondent or the speaker on the other end of the line… a compulsion to look at our fellow beings unites us. How can one not take an interest in faces, real or represented? Historically, portraiture has endured various strains of antipathy and, consequently, face painting’s position in the grand art hierarchy is well below battle scenes and even bathing nymphs. Today, high profile, non-photographic portraiture is generally reserved for champions of industry, politicians or royals and stylistically, old-fashioned classicism or ‘looks like a photograph’ photorealism continue to hang around this kind of portraiture like a bad smell. Contemporary art does, however, offer the stirrings of something more adventurous. Present day theories of 'nothing is true, everything is permitted means that ideas of the real have flown the coop. Now, what is real/what is imagined is blurred, smeared and re-configured within an art soup of endless possibilities. 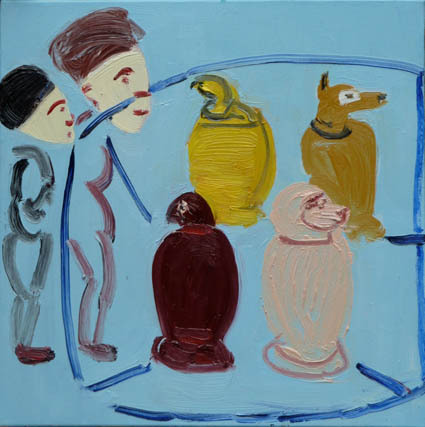 This 'dipping in and out of images' is evident in Hayes's work, which moves from Boxer Kicking Boxer through Egyptology to Café Dogs. 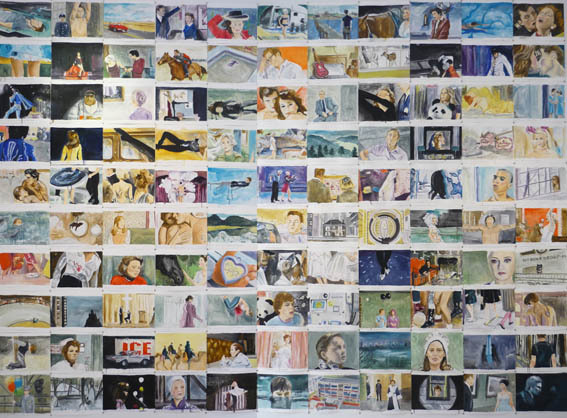 Cathy Lomax, has an infinity pool of references for her paintings of filmic moments. Cut adrift from their sequential narratives, these frozen moments refer only to their own re-configured reality. And so this moment becomes the tabula rasa, the starting block for the painting that may be the curve of Elvis’s cloak, the hem of a little girl’s dress or a Kiss-Me-Quick hat – each image now reborn in paint. In this process, it is as if Lomax is embarking on some latter-day artistic grand tour but, instead of the statues and fountains of Florence and Rome, she has at her disposal LOVEFiLM, iPlayer and YouTube. 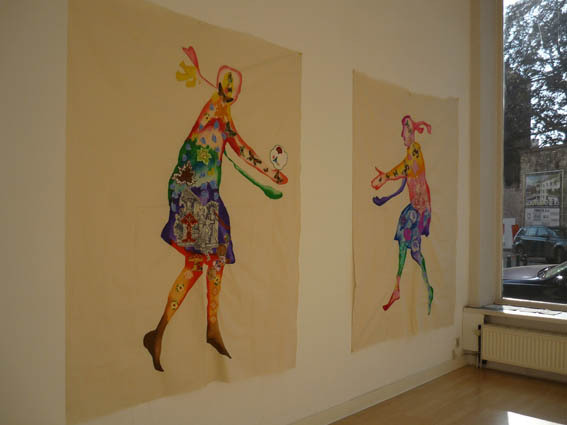 With issues that include racism, gender and cultural stereotypes Le Bas’s work deals with the wider political issues that have affected her, not only as a woman and an artist, but also as a Romany. The Face to Face artists are thus very far removed from any notions of staid classicism. More like 17th Century pirates, they plunder their iconographic booty of representational imagery, picking out any particular diamonds that catch their eye, to re-imagine, re-boot and re-assert a contemporary version of portraiture, which sparkles, surprises and informs with a complexity as varied as the subjects they are representing.